We like to answer all your questions, please read the following frequently asked questions regarding our products, if you can not find the answer for your questions, do not hesitate to call or email us. Thanks!!! What is the optic K9 crystal? Optic K9 grade crystal is known as the most perfect crystal and is the whitest crystal. Optic K9 grade crystal must not have any imperfections that could cause a low quality product. CubeCrystal.com offers the highest quality optic K9 grade crystal and therefore the resulting product are of the highest quality. K9 Crystals are high quality crystals 30% lead crystals, they come in all types of colors. What crystal shapes & sizes do you offer? We offer different crystal shapes: Diamond, Plaque, Cube, Heart, Rectangle, Oval, Round, Tower, Iceberg, etc… Most of the designs come in the Small, Medium, and Large sizes, from tiny 2″ up to huge 10″. What is the difference between 2D and 3D image? 2D and 3D refer to the actual dimensions in a computer’s workspace. 2D is ‘flat’, using the X & Y (horizontal and vertical) axis’, the image has only two dimensions and if turned to the side becomes a line. 3D adds the ‘Z’ dimension. This third dimension allows for rotation and depth. How long does it take to fulfill the engraving service? It usually takes 3 to 4 business days, rush order will take just one day and an additional $20.00 will be applied. Laser is an acronym of Light Amplification by Stimulated Emission of Radiation. A laser is a cavity that has mirrors at the ends and is filled with laserable material such as crystal, glass, liquid, gas, or dye. These materials must have atoms, ions, or molecules capable of being excited to a metastable state by light, electric discharge, or other stimulus. The transition from this metastable state back to the normal ground state is accompanied by the emission of photons which form a coherent beam. How do you engrave images on crystal? Can you turn a 2D image into a 3D image? Yes, our highly skilled and trained designers are working with the latest software and laser technology for image conversion to turn 2D images into 3D images. We make it easy for you – just give us your photo and we do the rest. Yes, we can take simple logos or graphics and laser them on to the glass in 3D. If the logo you send is not a 2D illustration or is made of complex color gradients, it may not work. If you have questions about your logo, email us at sales@cubecrystal.com. What is the requirements for my picture? High Resolution : What does “High Resolution” mean? It means that the photo is created or scanned at a minimum of 300 dots per inch (DPI). High resolution files retain more detail and allow us to create a sharper image inside the crystal. If you are scanning your photo using a photo scanner, the software that came with it will have a setting for High Resolution, or will allow you to select the DPI setting. While we can engrave lower resolution photos, they will not be as sharp as a higher resolution photo. Please do not ask us to engrave photos from the Internet since they are very low resolution and will result in very blurry engraved images. Good Contrast : Contrast means that you can easily distinguish the objects in a photo from each other. It also means that there is a good distribution of light and dark elements in the photo. Overly dark or overly light photos will not result in a high quality engraved crystal. If, for example, you send us a photo taken at night and all you can see in the photo is Aunt Mary’s eyes, her eyes will be what you see in the crystal. Conversely, overly bright or light photos will result in very bright and hard to distinguish engraving. What types of image file formats do you accept? Our system can process almost any image file format. The most common file formats include JPG, JPEG, GIF, TIFF, BMP, and PNG. If your file format is not listed here, contact us at sales@cubecrystal.com and we will let you know if your image format is compatible. 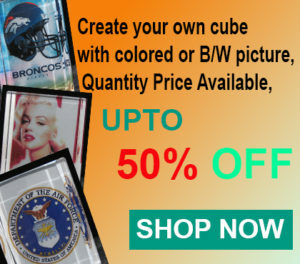 Be sure to make your order first and get the order #, then email your photo to photos@cubecrsytal.com with the order #, full name, telephone number and email, we will contact you if necessary. Will the background of my photo show up on the crystal? Only If you order a color crystal, we will keep the background. For 2D and 3D Engraving, our designers automatically remove the background. We do not offer proofs for individual orders. Since our designers do their best to match the 2D/3D engraving to the submitted image, your photo serves as the proof. For quantity order of 12 or more, we will send you a proof upon request. Can I include text on my crystal? Yes, you have the option of engraving text along with your image on a crystal. We offer 12 different font options for text: Time New Roman Regular, Time New Roman Italic, Time New Roman Bold, Time New Roman Bold Italic, Arial Regular, Arial Italic, Arial Bold, Arial Bold Italic, Lucida Calligraphy italic, Lucida Handwriting Italic, Monotype Corsiva Regular, Vivaldi Italic. What happens if/when an item is out of stock? You cannot order an item which is out of stock, please call us at 1-626-330-2970 to get the estimated time of arrival for that item. In the meantime, we will give you the replacement suggestion. You will be noticed by e-mail when that item will be restocked, and please feed back to us with your final decision. Check the amount of tracking numbers you should have received. Verify you have received all boxes and checked all packing material for small items. If you are still missing an item(s), call customer service immediately at 1-626-330-2970 and a representative will be more than happy to assist you. How do I order internationally? There is no way that you can order online internationally, unless you are from Canada. All the international order has to be sent by e-mail, you will get noticed by e-mail with the shipping information (services and fees) and our bank information, please wire the total amount to our bank account; we will process your order right after we got the money.